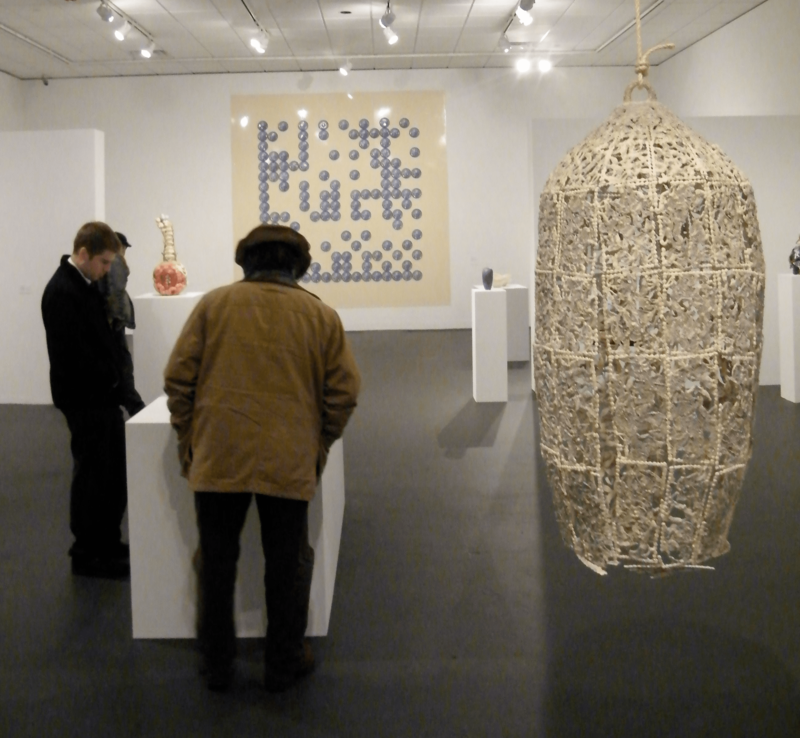 The 2015 NCECA Biennial had its opening reception at the David Winton Bell Gallery of Brown University on a snowy Friday, January 30 evening. 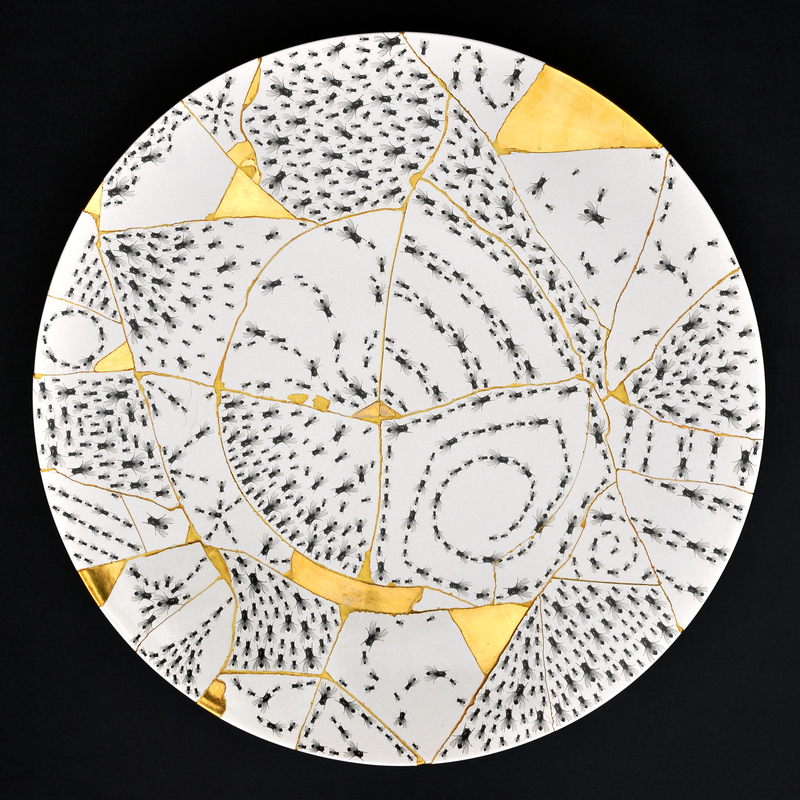 This year’s effort was juried by Bell Gallery Director, Jo-ann Conklin, studio potter Linda Christianson and Anders Ruhwald, head of ceramics at Cranbrook Academy of Art. NCECA’s recurring juried endeavor (first called the National and since 2009, the Biennial) represents an important opportunity for ceramic artists to bring their work to the attention of a knowledgeable audience. When three individuals with such diverse perspectives convene to select an exhibition, interesting and unpredictable things decisions are likely to result. Both the creators selected and those passed over are following paths of passion, commitment and perseverance. For every work included in the exhibition, there were probably six more worthy of gaining exposure to a wider audience. NCECA is grateful for the risk and effort so many willingly made. NCECA took inspiration from Rhode Island’s historic British charter in framing the theme of its 2015 conference, Lively Experiments. Any exhibition juried by a team from more than 1000 images to winnow down to fifty works owes as much to logic as it does to chance. Coincidentally, logic and chance are words shared by two works of British culture separated by more than one hundred years. The earlier Logic of Chance (1866) is a treatise on mathematics and rhetoric by logician and clergyman John Venn whose charts of intersecting circles (Venn diagrams) graphically represent sweet spots where clusters of commonality are expressed from within an array of diverse and disparate possibilities. More recently, the hiphop duo Dan le Sac vs. Scroobius Pip appropriated the Venn’s title for a 2010 release of rhymes and electronic beats. Their song, Get Better, speaks directly to working-class teens’ longing for meaningful connection at amidst decay and hopelessness, “They confuse love at first sight with lust at first light.” Logic and chance are metacognitive certainties in a world organized through uncertainty. While Lively Experiments was not meant to offer a direct framework for this Biennial, it did inspire NCECA to consider the vision of experiences to be realized in Rhode Island. Inquiry into the life and history of objects and architecture are focal points of works by Ivan Albreht, Jeremy Brooks, Joshua Clark, Jessica Edward, Karin Karinson and others in the exhibition. 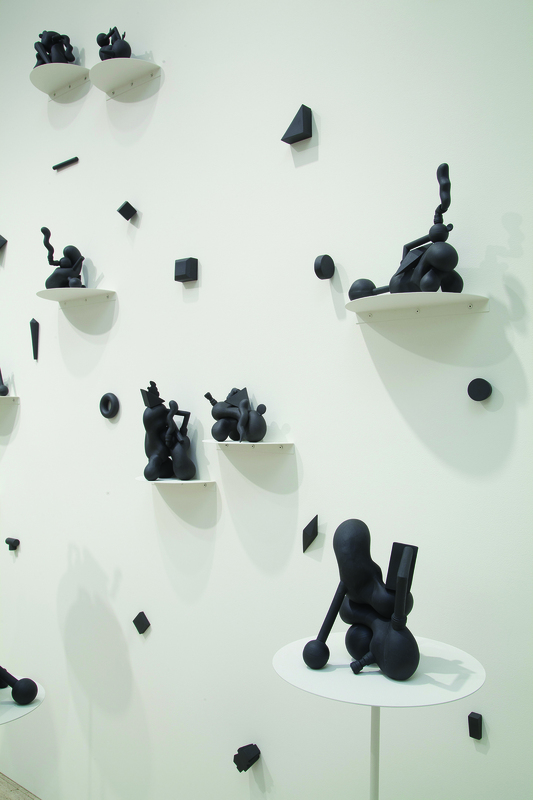 They celebrate ceramics, in part for its outsider status in art discourse. These artists’ works suggest movement from the margins into the mainstream of cultural production while remaining tethered to decorative arts traditions. In counterpoint to such conceptually framed efforts, wood fired works by Nancy Green, and Craig Hartenberger are immersed in materiality, process and time. Vlad Bassarab’s Archaeology of Memory_Large Book juxtaposes a physical object (a book made of slip covered pages) with a video documenting the erosion of its doppelganger. While the former works emphasize clay’s transformation through heat to achieve rocklike durability, the latter uses water to highlight its transmutation and fragility. These points along the continuum of clay’s variable condition are essential understandings of ceramic experience. Works by Zimra Beiner, Ned Day, Misty Gamble, Jeffrey Mongrain, Aaron Nelson and Yun Wook Mun initiate from the inter-relation of form, data and the permutation of multiples. Alluding to both the current information age and familiar rhythms of ceramic production, through systems of display and mutability, these artists explore the nature of innovation as a process of organic evolution. The studio craft legacy also has its share of space in the 2015 NCECA Biennial. Works by Jeremy Ayres, Philip Finder, Lauren Karle, Clay Leonard and Lorna Meaden embody values of function, design and tacit knowledge. Their spirit adheres to the notion that ceramic objects through their beauty and usefulness, transform daily live and uplift the human spirit. A hallmark of the Arts and Crafts movement that persists even as box stores multiply and 3-D printing becomes accessible to us all, these values may be moving back to the vanguard if not in the art-world, then in the broader society as words like artisanal, craft and authenticity are applied to everything from bread to beer and fashion. A full color catalog of the 2015 NCECA Biennial is now available for pre-order at www.nceca.net. The exhibition remains on view through March 30, 2015. A public reception will take place on Thursday evening March 26, 2015. Artists included in the exhibition are… Ivan Albreht, Jeremy Ayers, Vlad Basarab, Zimra Beiner, Jeremy Brooks, Ling Chun, Joshua Clark, Donna Cole, Ned Day, Jessika Edgar, Phillip Finder, Sean Michael Gallagher, Misty Gamble, Nancy Green, Craig Hartenberger, Karin Karinson Nilsson, Lauren Karle, Jin Kim, Young Mi Kim, Eva Kwong, Thomas Lane, Clay Leonard, Janet Macpherson, Andrea Marquis, Amiko Matsuo, Lorna Meaden, Jeffrey Mongrain, YunWook Mun, Aaron Nelson, Marissa Neuman, Ginnifer O’Keefe, Brooks Oliver, Virginia Pates, Peter Pincus, Paolo Porelli, Matt Repsher, Liza Riddle, Kate Roberts, John Rohlfing, Raymond Rorke, Bonnie Seeman, Gertrude Graham Smith, Zac Spates, Katherine Taylor, Ian Thomas, Matthew Towers, John Utgaard, and Christy Wittmer.